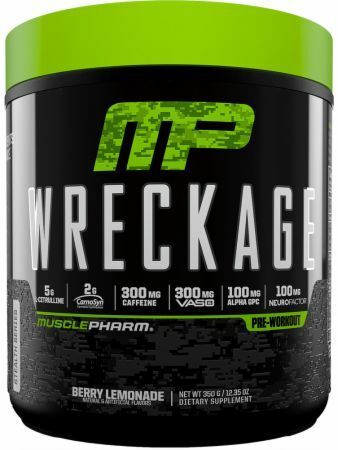 MusclePharm Wreckage at Bodybuilding.com - Best Prices on Wreckage! My first time using this and I can honestly say it pumped me up during my work out so much. Not the jittery pump but just got me going lifting more weight than usual. By the time I was done I was tired as hell so it didn't keep me amped all night. I took a half scoop in the morning and half before my work out. Tomorrow I will try a full scoop and see how it goes but so far so good. I bought this product on here after seeing the good reviews. Initially I didnt like the flavor, it reminded me of sour straws that were soaked in water and then drinking the water. After about a week I got used to it and it was decent tasting. This gave me the best pump out of any preworkout I've tried so far and I didnt feel jittery or get an upset stomach after drinking it on an empty stomach in the morning. It gave me a slight boost in energy, but wasnt the boost that I am used to with other products, I could be just used to more caffeine though. While I'll be trying something else next, I'd say it's worth trying this. I'd give it about an 9 overall because it gives an awesome pump but for me it falls short on the energy part and the flavor I don't mind but I've had better. This is not just my favorite pre workout, but my favorite supplement overall. It doesn't even compare with other ones, is on it's own league. The pump was nothing crazy but it gave me so much energy and focus - not just for the workout but for the whole day, helping me a lot with studies and work. Flavor was very spicy, even with 12oz. That may not be good for some but for me it's perfect. Workouts now are better than ever, but I would't use it or recommend using everyday. Honestly I gave up on MP pre-workouts for a while. This one put them back in the game for me. Great for heavy sessions. Tried it on a whim and now im puttin it back in my routine. Nice work MP. 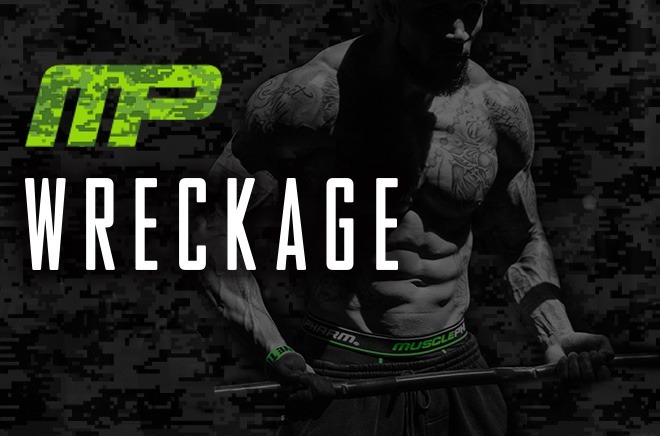 Love Musclepharm products. 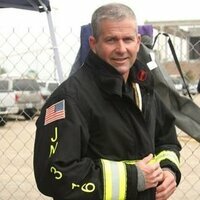 I run the firefighter challenge. A grueling competition that takes everything out of you. 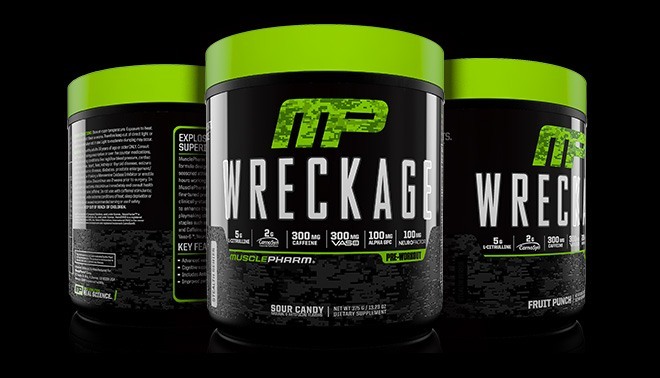 Wreckage definitely helps get me through the course and I don’t have to worry about banned substances. Thanks Musclepharm for great and clean products! Flavor was great. Great dose of citrulline 5g. This is definitely my favorite pre workout right now. Perfect combination of energy, focus and pump. Fruit punch flavor is delicious with a good amount of water. Been a Week ten days of trying this and I got to say that this is indeed one of the best ones out there. The Pump is consistent and specially on my lazy days totally helped me push through the last limit. I received a sample with my last BB.com order, and this product is amazing. I get home from work late so my workouts are in the evening, and that's when I'm tired from the long day and I usually take a caffeine pill. The sample did a lot more for me than the pill ever did. I had a lot of energy, and I was able to lift heavier weights than usual during my late workouts. The sour candy flavor is OK, but I'm buying the fruit punch flavored, full product because I'll probably like the taste better. I had been using a different preworkout and they changed it up on me. I Started to feel a crash after they changed it, so I switched over to this and have to say I love it and have not been let down yet. I add a scoop of creatine with it and it's been everything that I was looking for. I received a sample packet of this with my last order. Let me say, I’m very glad that this is the sample that they chose to give me. It’s hard to find a solid preworkout that meets the criteria of being clean, flavorful, and has enough pump. This one nails them all. I’ve had sour candy preworkouts in the past, all of which were pretty nasty on the flavor side. Sour candy is usually a flavor that’s hard to get right, in my personal opinion. I’ve had many in the past, and disliked them all. I really enjoyed the performance during my workout after drinking Wreckage. 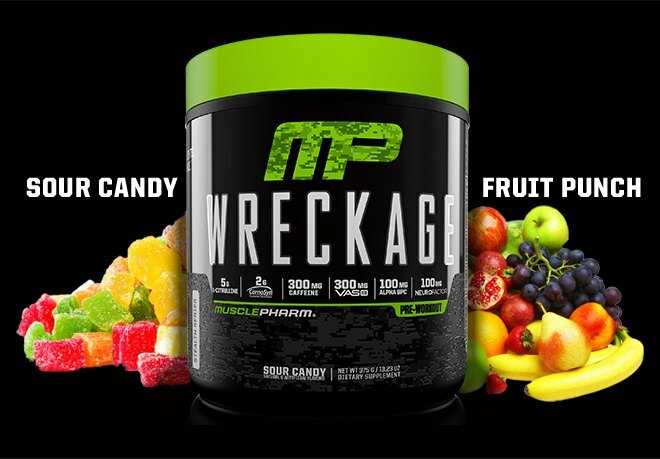 I will definitely be ordering this when it’s time to reup on my next preworkout. Appreciate the sample BB.com. This is certainly the best pre-workout I have ever experienced. I declare that I do not encourage myself to train at the gym without a good pre-workout and this exceeded my expectations. 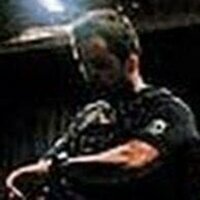 The focus and energy that it releases is really exceptional, it has a continuous flow of energy without ups and downs or strange sensations (it has that itch in the ear of beta alanine, and only) and when the effect ends does not leave discouragement or fatigue, only a high dopamine sensation of good workout performed. The only wreckage left is the lighter weights. I strongly recommend it! 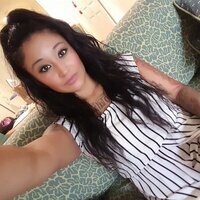 Loved this product. 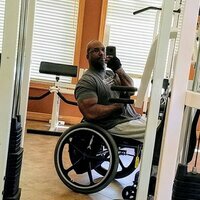 Gives me a great kick/pump for my workout and keeps me going. Also I like the sour candy flavor. Not to sweet tasting has a good sour balance! Citric Acid, Malic Acid, Natural & Artificial Flavor, Silicon Dioxide, Calcium Silicate, Sucralose, Fruit & Vegetable Juice (Color), Acesulfame Potassium. 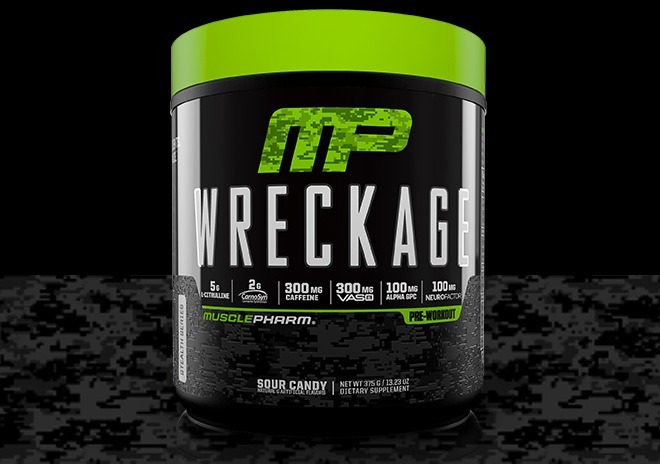 Directions For Wreckage: For advanced users, mix one serving (1 scoop) of MusclePharm Wreckage™ in 8-12 fl. oz. of cold water and consume 20-30 minutes before training. For first time or inexperienced users, begin with a half serving (½ scoop) to assess tolerance. Do not exceed one serving per day. Use as part of a healthy diet and exercise program. Warnings: For healthy adults 18 years of age or older ONLY. Consult with Physician, if pregnant or nursing; using prescription or over the counter medications, or have pre-existing conditions like: high/low blood pressure, cardiac arrhythmia, stroke, heart, liver, kidney or thyroid disease, seizure disorder, psychiatric disease, diabetes, prostate enlargement/urination issues; or if taking a Monoamine Oxidase Inhibitor or erectile dysfunction medication. Discontinue use 2 weeks prior to surgery. In case of adverse reactions, discontinue immediately and consult health professional. Contains caffeine. Do not use if sensitive to caffeine, or with caffeine, stimulants, alcohol, nitrates, under extreme conditions of heat, sleep deprivation or dehydration. KEEP OUT OF REACH OF CHILDREN. Store at room temperature. Exposure to heat, light or air can affect flavor or aroma. Therefore keep out of direct light or heat. Keep sealed when not in use. Light to moderate clumping may occur.